Social media are a powerful tool for getting more clients, and furniture companies are perfectly aware of that. And if they aren’t, they definitely should be. Posts with lots of comments, likes and reposts help to achieve marketing goals of the firm, while the bad ones do the opposite. For Social Media Marketing a powerful tool to increase furniture sales! So, how does one create good posts that your clients will like? How to make competitors jealous? 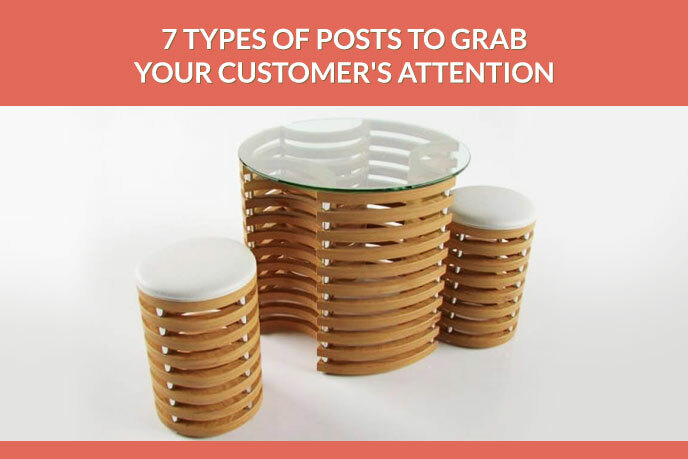 We’ve conducted a survey and created a list of 7 Types of Posts that will help you create an engaging content and get a broad reach on Facebook. Publications that target no one in particular or pretty much everyone can entertain a lot of people, generate lots of likes and even be shared. Unfortunately, such content marketing strategy won’t bring new customers – the target audience don’t have the chance to read it. Define the exact type of customer you want to attract. Think of what he wants and needs to read, what language he speaks, when he’s more likely to check news. This information is crucial for creation of effective social media content. Using the power of Social proof is a good idea too. To tap into this power, ask your clients for a feedback. For instance, organize a contest for the best life story connected to a piece of furniture of your brand. It should include photos, an emotional story and the hashtag of your choice. Tell the audience what are your unique motives to do what you are doing. That story makes a company different from the others. Moreover, it generates an emotional response translating later into subscriptions and purchases. To turn this story into an experience, don’t just tell it with words. Luckily, modern technology provided marketers with many creative ideas. Show the unique position of your Furniture company by means of Virtual reality. Besides from the obvious appeal, it’ll score you a few points for being a visionary: Virtual Reality Marketing is a raging trend. Educate the audience on how to use the furniture. Fill the publications with Educational Animations showing how to assemble and use the furniture of your brand. This gives an opportunity to give value while showcasing the best features of the product. Talk about your furniture as if about a living being. Make it live, breath, talk to the customer with help of content marketing. Describe how the table is made with help of a totally unique technology that no one else has yet adopted, from a totally amazing wood that has been transported from far lands specifically for this purpose. And all that – with help of 3D Animation. Immerse the client into the story with help of 3D technology and get familiar with the product. As you can see, developing an effective strategy is an absolutely realistic project. With help of a careful approach, constant analysis, some fresh Furniture Marketing Ideas and modern technology it is possible to attract a lot of new clients. To increase the customer involvement with powerful 3D visual information, contact UFO3D. Our 3D Artists create powerful 3D Modeling and Visualization solutions to make your social media content look breathtaking.